View or download the program here or by clicking the cover photo at right. Please also see below for frequently asked questions and reservation instructions. Click here for updates on availability, corrections, and other important notifications. Please also follow us on Facebook, Twitter and Instagram for more information. Where can I find the program booklet? Click here for a digital version of the program and please check the above Updates and Corrections link regularly for updated information. Members of the Atlanta Preservation Center have been mailed hard copies of the program. Copies will be available with our Preservation Partners and other public venues around the City, as well as the Atlanta Preservation Center. Priority reservations for Atlanta Preservation Center members begin on Thursday, February 7 and continues through Tuesday, February 19. Atlanta Preservation Center members also will receive priority on reservation waiting lists. (Please note that priority reservations are only available to reservations being handled by the Atlanta Preservation Center.) Atlanta Preservation Center reservations for the General Public open on Wednesday, February 20. All events will be free to the public. For more information, call (404) 688-3353.
Review the event listing for reservation information and specific details. Reservation requirements, if needed, vary by Preservation Partner. How do I request a reservation? Does sending an email or leaving a message mean that I have a reservation? • Follow the reservation instructions provided for your specific event(s). 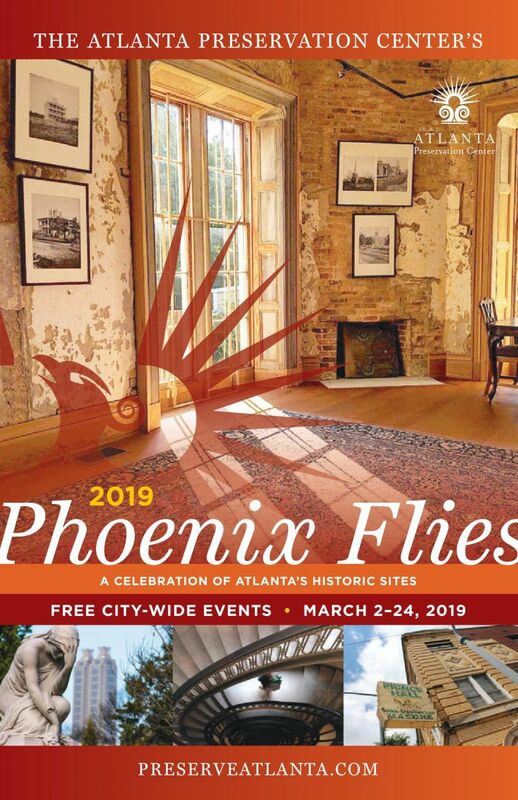 • If the Atlanta Preservation Center is taking an event’s reservation, please send an email request to phoenixfliesreservations@preserveatlanta.com. (Otherwise, follow instructions for the Preservation Partner.) If you are unable to email us, you may request a reservation via telephone at (404) 688-3353, Ext. 15. • Do not submit duplicate reservation requests (via email and telephone). Duplicate requests may result in a delay processing your request. Your reservation is NOT confirmed until the Atlanta Preservation Center has notified you. All reservation requests will be responded to in the order they were received. We appreciate your patience. The Atlanta Preservation Center makes every effort to respond to reservation requests as soon as possible. Due to staffing limitations, the Atlanta Preservation Center cannot guarantee to respond on weekends or outside of daytime business hours. If you need to make or cancel a reservation, please contact us as soon as possible to ensure availability for others. What information do I need to provide in my reservation request? · The total number of people in your party, including yourself. What is your cancellation policy for outdoor events? Cancellations for the Atlanta Preservation Center's guided walking tours due to inclement weather will be at the discretion of the tour guides. For outdoor events from our Phoenix Flies partners, any cancellation will be at the discretion of the individual organizations regarding their outdoor events; some events have provided cancellation information in their event text. How can I support Phoenix Flies? We hope that you will consider joining the Atlanta Preservation Center to support the Phoenix Flies Celebration and our other unique events! Please click here to support the Phoenix Flies Celebration with a one-time donation or join the Atlanta Preservation Center.